Computer Science & Software Eng. Sanjeev Baskiyar received the PhD and MSEE degrees (major: Electrical (Computer) Engineering, minor: Computer Science) from the University of Minnesota, Twin Cities (Minneapolis), in 1993 and 1988 respectively and the BE (Electronics and Communications) degree from the Indian Institute of Science, Bangalore in 1984. He received the BS degree in Physics with honors and distinction in Mathematics in 1981. He was a recipient of several competitive national and state-merit scholarships. His academic record has been in the top decile. He was nominated for the Best Teaching Assistant of the Year award in the ECE dept. at the University of Minnesota, Minneapolis. He has taught courses in the areas of Real-time and Embedded Computing, Computer Architecture, Operating Systems, Microprocessor Programming and Interfacing and VLSI Design. 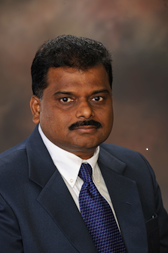 His experience includes working as an Assistant Professor at Western Michigan University, as a Senior Software Engineer in Unisys Corporation, and Computer Engineer in Tata Motors, India. Dr. Baskiyar’s research has been supported by grants from the National Science Foundation, DARPA/AFRL, NASA/MSGC, Wind-River Systems and Mentor Graphics. Scheduling, Real-time and Embedded Computing, Storage, Computer Architecture, Distributed Computing, STEM education. I am currently offering scholarships supported by NSF for US citizens and Permanent Residents. For information and application on these scholarships, please e-mail me. 1. Resource and energy aware scheduling: This goal of this project is to develop and evaluate schedules for embedded systems, multi-core computers, clusters and grids. The target is to develop adaptable and scalable schedules that are resource aware (memory, computational power) as well as energy and thermal conscious. 2. Real-time micro-architecture: This project investigates the use of secondary bus between cache and memory to develop better micro-architectures. It also investigates the use of wireless technology to develop better fault tolerance and cache coherence techniques. It involves performance analysis and hardware design. 3. Storage architecture: This project investigates novel data and meta-data organization within disks, disk-clusters and flash drives for better timing, energy, fault tolerance and wear. 4. Education: This project involves development of concept graphs and cartoon strips for computer science education. 7. Chiao Huang, Taiwan Energy, Taiwan. 9. Cong Liu, MS, ->PhD, Univ. of NC, Chapel Hill -Assistant Professor, Univ. of TX, Dallas. 10. Yong-won Park, MS, PhD student, Auburn University. 11. Christopher Dickinson, MS, Entergy. 12. Sudhakar Jonnalgadda, Oracle, CA. 13. Ahmed Owian, BS (Honors thesis)->MS Univ. of Memphis, Sr. Programmer/Analyst, FedEx,Memphis. 14. Sreekanth Boga, MS, Embedded Systems Engineer, Qualcomm, CA. 16. Karthik Vemula, MS, InfoTech, Gainesville, FL. 17. Chengjun Wang, PhD, Assistant Professor, Vermont Tech, VT.
18. John O’Farrell, PhD, Science Applications International Corporation (SAIC), Huntsville, AL. 19. Adarsh Jain, MS, VmWare, Atlanta, GA.
20. Swathi Bathula, Intel Corporation, Oregon. 21. Sankari S. Anupindi, PhD, Blackhawk Networks, Phoenix, AZ. 2. Design and evaluation of an interface to flash to merge writes that double its lifetime. 4. First use and evaluation of Support Vector machine to schedule tasks on clusters/grids. 7. Design and evaluation of path from write-back buffer to main memory, which significantly enhances processor real-time performance. 8. Design of intra-chip wireless communication to enhance computer architectures. 3. J. W. O’Farrell and S. Baskiyar, “Enhanced real-time performance using a secondary bus for cache write-backs, International Journal of Computers and Applications,” Vol. 37, issue 1, pp 1-9, January 2015, Taylor and Francis. 6. J. W. O'Farrell*, R. T. Venkatesh*, S Baskiyar, “Secondary Bus Performance in Retiring Cache Write-Backs to Memory,” ISCIS, pp 463-469, London, UK, 2011. 8. O’Farrell, J. * and Baskiyar, S., “Improved Real-Time Performance Using a Secondary Bus,” Proceedings of the Computers And Their Applications,” Honolulu, HI, March 2010, ISCA Press. 9. Park, Y.-w*, Casey, K* and Baskiyar, S.*, “A novel adaptive instance based learning approach to task scheduling,” Proceedings of the 9th International PDCN, pp. 32-36, Feb 2010, Innsbruck, Austria, IASTED Press. 10. Baskiyar, S. and Wang, C*, “A split disk cache architecture to reduce read miss ratio,” Proceedings of the 9th International PDCN, Feb 2010, Innsbruck, Austria, pp. 249-254, IASTED Press. 12. Liu, C.* and Baskiyar, S., “A Scalable Grid Scheduler for Real-Time Applications,” International Journal of Computers and Their Applications, vol. 16, no 1, pp. 34-42, 2009. 13. Liu, C.* and Baskiyar, S., “Scheduling Mixed Real-Time Tasks in Grids using Bin Packing,” Proceedings of the 14th IEEE International Conference on Parallel and Distributed Systems (ICPADS), pp 229-236, IEEE Computer Society, Dec. 2008. 15. Soares, C., Page, G., MacDonald, J., Baskiyar, S., Hamilton, J., and Dozier, G., “Bowl championship series vulnerability analysis,” Proceedings of TAPIA Diversity in Computing, pp 1-4, Orlando, Florida, October 2007. 16. Liu, C*, Baskiyar, S. and Li, S.*, “A General Distributed Scalable Peer to Peer Scheduler for Mixed Tasks in Grids,” Lecture Notes on Computer Science, vol. 4873, pp. 320-330, Springer, 2007. 17. Baskiyar, S. and SaiRanga, P.*, “Scheduling DAGs on heterogeneous network of workstations to minimize finish time,” International Journal of Computers and Their Applications, vol. 13, no 4, Dec 2006. 18. Baskiyar, S. and Palli, K.K. *, Low-power scheduling of DAGs to minimize finish time, Lecture Notes in Computer Science, pp. 353 -362, 2006. 19. Abdel-Kader, R.* and Baskiyar, S., “Power managed task scheduling on heterogeneous systems,” Proc. of International Conference on Parallel and Distributed Computing, ISCA, 2006. 20. Cong, L.*, Baskiyar, S. and Wang, C.J. *, “A distributed peer to peer grid scheduler,” Proceedings of the International Conference on Parallel and Distributed Computing and Systems, IASTED, Nov. 2006. 21. SaiRanga, P.* and Baskiyar, S., “A low complexity algorithm for dynamic scheduling of independent tasks onto heterogeneous computing systems,” 43rd ACM SE conference, Kennesaw, GA, March 2005. 24. Baskiyar, S. and SaiRanga, P.C. *, “Scheduling directed a-cyclic graphs on heterogeneous computing systems, Workshop on CRTPC in Proc. 32nd International Conference on Parallel Processing, 2003. 25. Baskiyar, S. and SaiRanga, P. C.*, “Scheduling DAGs on heterogeneous network of workstations to minimize finish time,” Proc. ISCA 16th International Parallel and Distributed Computing Symposium, pp. 30-35, 2003. 28. Baskiyar, S. and Dickinson, C.*, “Scheduling directed a-cyclic task graphs on heterogeneous processors using task duplication,” LNCS, vol. 2913, pp. 259-267, Springer, 2003. 31. Baskiyar, S., “A survey on real-time operating systems,” Proc. IASTED-NPDA, 2002, Tsukuba, Japan, Acta Press. 32. Baskiyar, S., “A software simulation of DNA computing,” Proc. 15th PDCS, 2002, pp 373-378, Louisville, KY, ISCA. 33. Baskiyar, S., “Simulating DNA computing,” Lecture-Notes in Computer Science, v. 2552, pp. 411-419, Springer, 2002. 34. Baskiyar, S., “Scheduling task in-trees on distributed memory systems,” Proc. 15th IPDPS, San Francisco, CA, 2001 (IEEE-ACM). 37. Baskiyar, S., “Speeding Smalltalk programs using follow-up compilation,” Proc. EIT Conf, Chicago, 2000, IEEE. 39. Baskiyar, S. and Kain, R.Y., “Smith chart with GUI,” Proc. NC-ASEE Conf., Erie, 1999. 40. Baskiyar, S. and Kain, R. Y., “On the complexity of scheduling task trees on multiprocessors to minimize makespan,” Japan Society of Artificial Intelligence, vol. SIG-PP-93, 1993. 41. Baskiyar, S. and Kain, R. Y., “Architectural support for enhancing object­-oriented program execution times,” Proc. OOS, Jan. 1993, San Diego, CA. 42. Baskiyar, S. and Kain, R. Y., “On the complexity of scheduling task trees on multiprocessors to minimize makespan,” Proc. JSPP, Tokyo, Japan, 1993.
a. International J. of Comp. and Applications, Acta Press, 2003-2012.
b. International J. of Parallel and Distributed Compting, Acta Press, 2012-2013. 3. Program Committees: 16th International Conference on Computer Applications in Industry and Engineering, 2003, ISCA, Program Technical Committee, EESD Workshop, 22nd IEEE International Performance Computing and Communications Conference, 2003. 6. Panels and Reviewer: National Science Foundation, Arlington, VA, IEEE TPDS, JPDC, Conferences, Book reviews etc. 1. Principal Investigator: REU: Parallel and Distributed Computing, $290,000, National Science Foundation, 2017-2020. 2. Principal Investigator: Educating Talented Scholars in Computer Science and Software Engineering, $594,352, National Science Foundation, 2010-2014. 3. Principal Investigator: Enhanced Micro-architectures for Real-time Systems, $160,366, DARPA, 2009-2010. 4. Principal Investigator: Wireless Techniques in Architecture and Fault Tolerance, National Science Foundation, 2004-2006. 5. Principal Investigator: Scheduling in Computational Grids, National Science Foundation, 2004-2005. 6. Principal Investigator: Embedded Networks and Real-Time and Embedded Computing, $1,440,000, Wind River Systems, Software in-kind grant, 2003-2008. 8. Principal Investigator: IRSC Grant, Auburn University, $20,000, 2000-2001. 9. Principal Investigator: Research Initiation Award; College of Engineering, Auburn University, 1999-2000. 10. Principal Investigator: Research and Creative Support Award, $5,000, Western Michigan University, Kalamazoo, MI, 1998-99. 11. Principal Investigator: Graduate Student Support Award, $5,000, NASA/MSGC, 1997-1998. 12. Principal Investigator: Research Development Award, $1,250, Western Michigan University, Kalamazoo, MI, 1997-1998. 13. Co- Principal Investigator: Mentor Graphics Software Equipment Grant, Mentor Graphics, 1998.